I'm 6' 7" and have been researching the options for a recliner or lounge chair that will fit a very tall person. I've talked with several tall people about how a chair should fit a body. 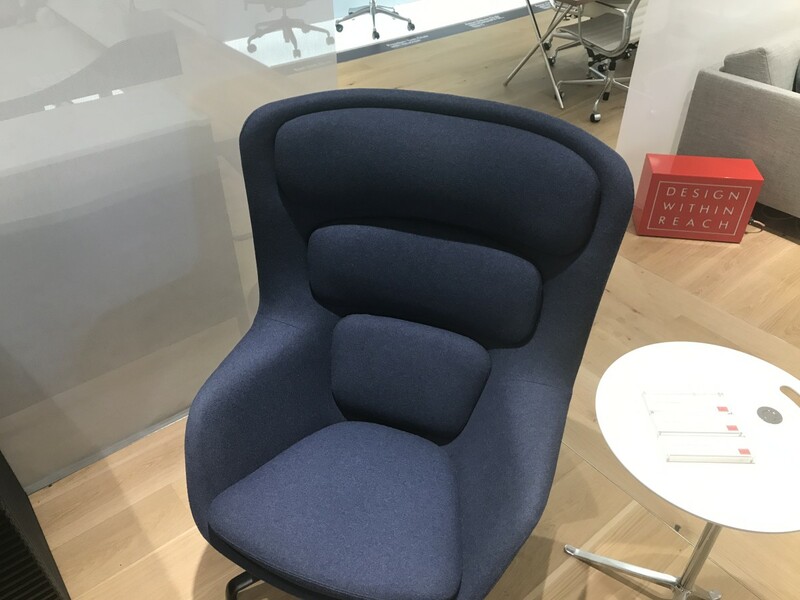 The main concern is that people sit a few inches forward from the back and that the heel should rest on the downward slope of the footrest so it's fully supported. The weight of the leg should not create significant pressure on the heel nor should the heel be extended beyond the footrest so that it's dangling over the edge. 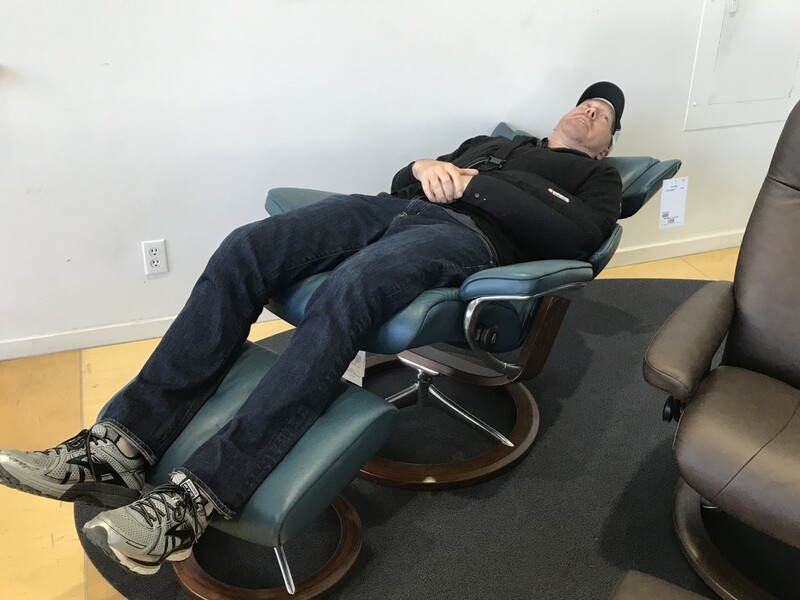 I went to the La-Z-Boy shop and sat in all the tall recliners they have in their showroom. I liked how soft and relaxing they felt. Their backs were plenty tall enough to support my head when they were fully reclined. There were options available under a thousand dollars. 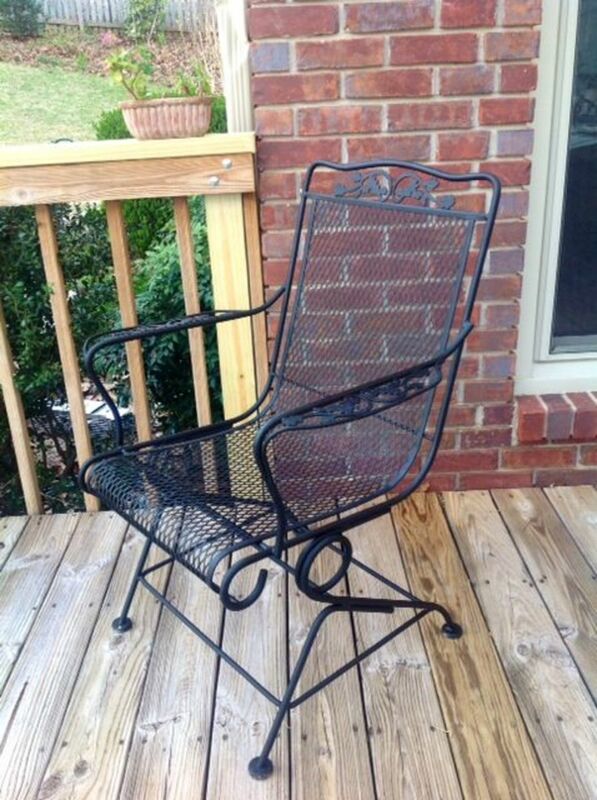 While that sounds expensive, these were the lowest cost chairs I found. What I didn't like is the length of the chair. When it's fully extended, it's just not long enough. My feet hang over the foot rest and after sitting for about ten minutes, my legs felt uncomfortable because the foot rest ends about 2/3 the way down my calf and my feet dangle over the edge. 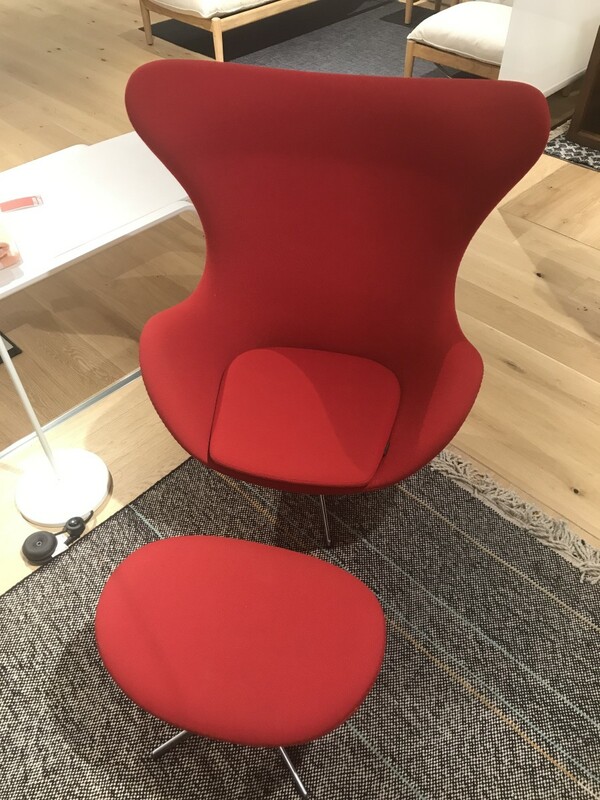 If the chair was long enough, I may have purchased one, but I also didn't like how bulky it looks. We have an average size family room in our house and the chair seems bulky. 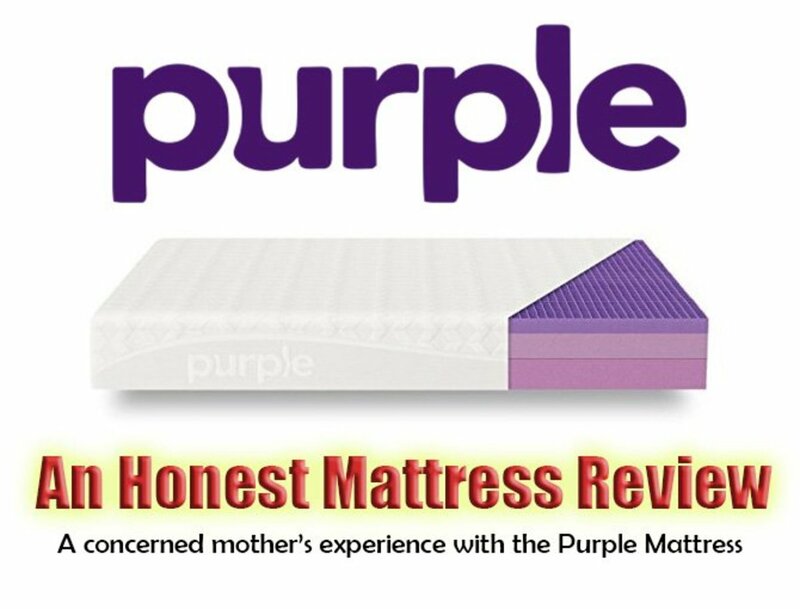 I'd prefer a sleeker, more modern design. Room and Board has a recliner for tall people called the Dalton that is made for them by American Leather. What I like about the Room and Board recliner is the design. It's modern and sleek. However, even with the extra extension, it's too short for my legs. With 36 to 37 inch inseams, my feet dangle over. In forums, I found lots of tall people talking about Stressless chairs by Ekorne. They have recliners with the built-in footrest, but they also have an ottoman option. They are made by a Scandinavian furniture company. I really liked the comfort of the chair. The option with the high back and adjustable headrest fit me, and while I didn't find the built-in footrest long enough, the ottoman works great. These chairs come in sizes of small, medium, and large. One feature I liked is that the head can be tilted up and then the chair fully reclines to a comfortable sleeping position. The chair I'm looking at is about $4,000. It's expensive. The issue we are having is that the design is a bit polarizing. I find it attractive, sleek, and modern, but my wife didn't like it. While she wasn't super descriptive, she said she thought it was dorky looking. One other thing I found a little uncomfortable is the leather. It's a tad slippery and caused me to slide forward. All in all, of all the chairs I've tried, this has been the best fit for a tall person. American Leather makes the best sleeper sofa with a really cool mechanism and a mattress that isn't all lumpy like sleeper sofas where the mattress is folded in thirds. I was hoping their comfort recliner would be equally cool and comfortable. 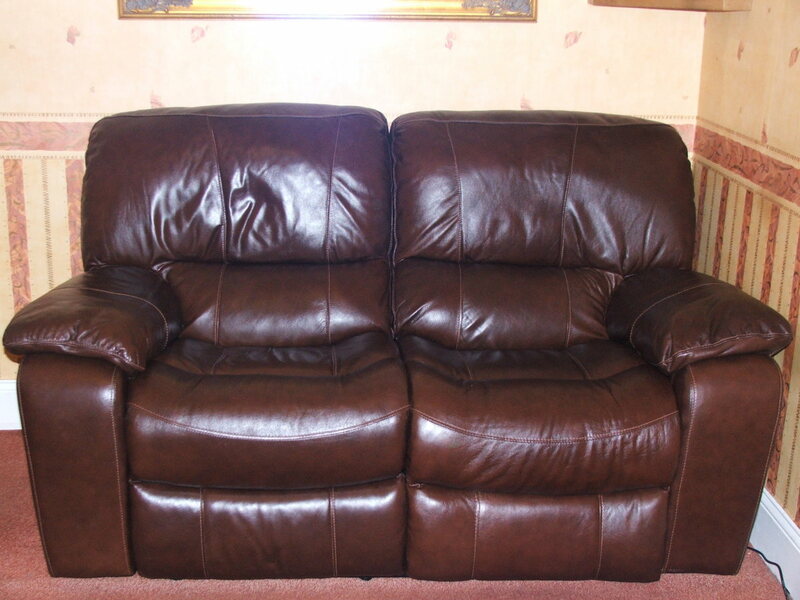 American Leather also makes recliners sold by Room and Board (Dalton Recliner). The recliner comes in two lengths. The longest is 47 inches from the back of the seat to the end of the footrest. This will likely fit someone 6' 4", but if you're taller than that, the footrest ends at the Achilles heel. The pros are its high-quality components and the appealing design. The downside is it's just a tad too short for me. 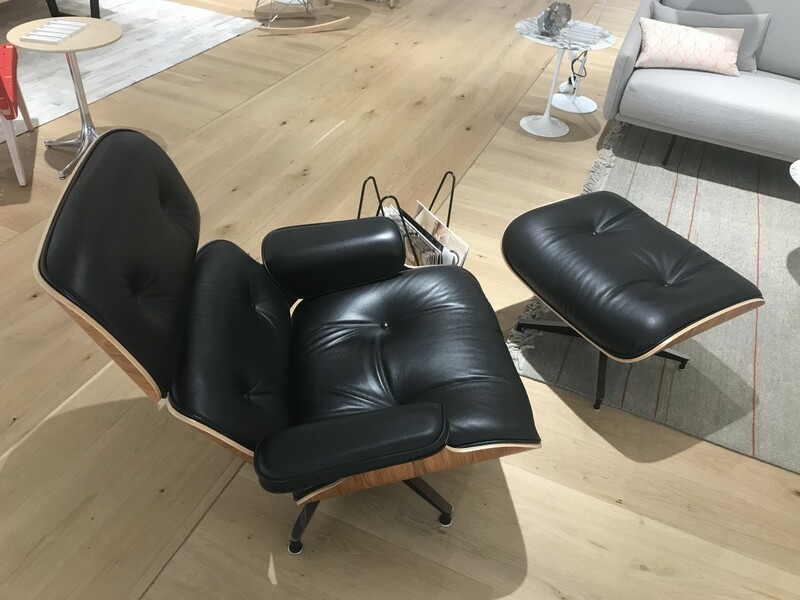 I was excited to see a tall Eames chair. This is a scaled design of the original chair that was developed in the 1950s. The design is modern but classic, and it's the best-seller at Design Within Reach. It also goes on sale twice a year for 15% off (in April and November) and has free shipping, which is like another 7% off. This chair is tilted back and built for reclining. I wouldn't stick it in a social place in the house and expect people to talk. As soon as I sat down, my instinct was to shut my eyes and go to sleep. It feels very comfortable, but with my back and bottom pushed all the way back, my head was way past the headrest, with little support. That said, the seat is long enough to that if I pull it forward and slouch a bit, then my head rests comfortably. 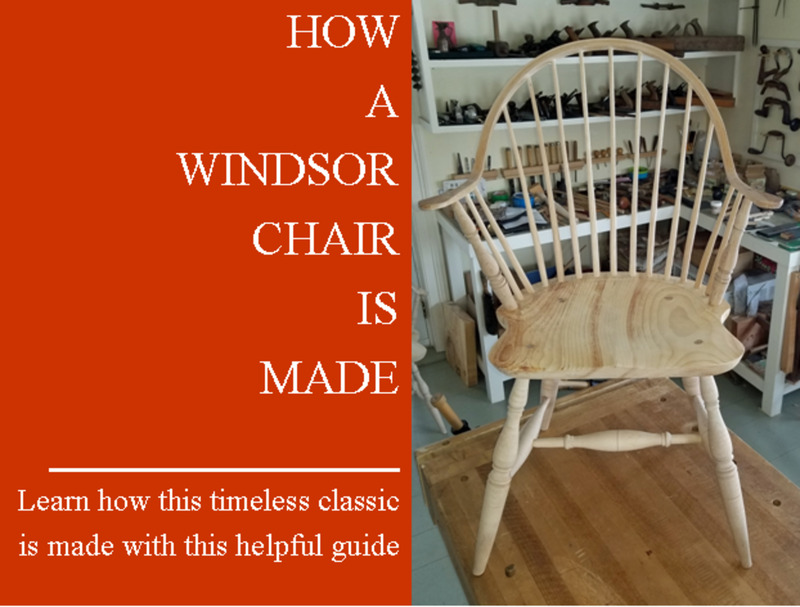 The tall version, depending on the wood and leather used when they are assembled by hand in Michigan, costs from $5,000 to $6,500 and takes about 6 to 8 weeks to be made. 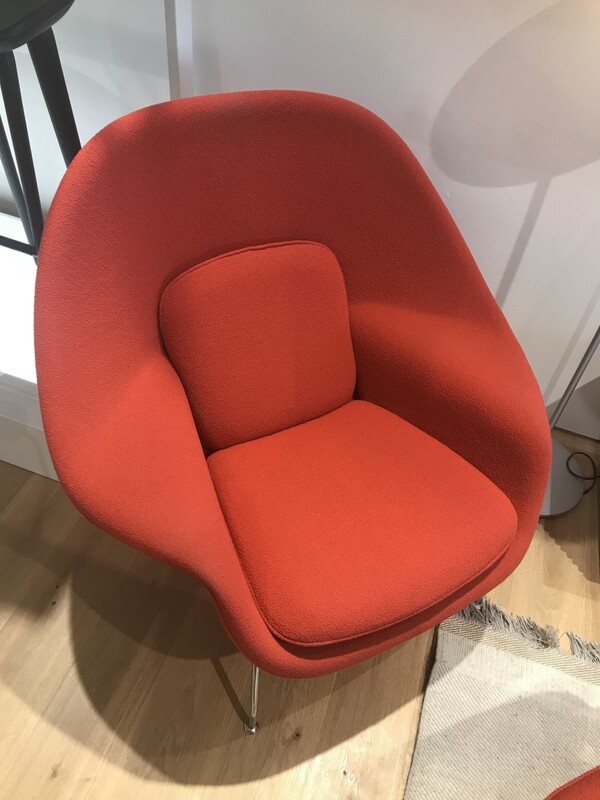 This chair ranks as my favorite design, but is just a little too short for proper head support to be my overall favorite. What About a Custom Recliner? I've called a number of stores, but so far, I haven't found a company that makes a custom fit recliner. It sounds like the main issue is the mechanism that reclines the chair and extends the footrest is standard, so it's hard to find an extended option that keeps the chair in balance. So far, I haven't found anyone that can make a custom extension so the footrest is long enough, but I'll keep looking. The Striad has a tall back and fits well, but it's very firm and doesn't recline. It also has a modern design. The Egg and Womb chairs are classic modern designs that are firm and don't recline. If I was picking from these, I'd select the Striad because of the tall back and better neck support. What's your favorite recliner for a tall person? 46 votes so far. Click a star to add your vote! Have you check Barcalounger Big and Tall? The Montana model says it's 67" reclined length. 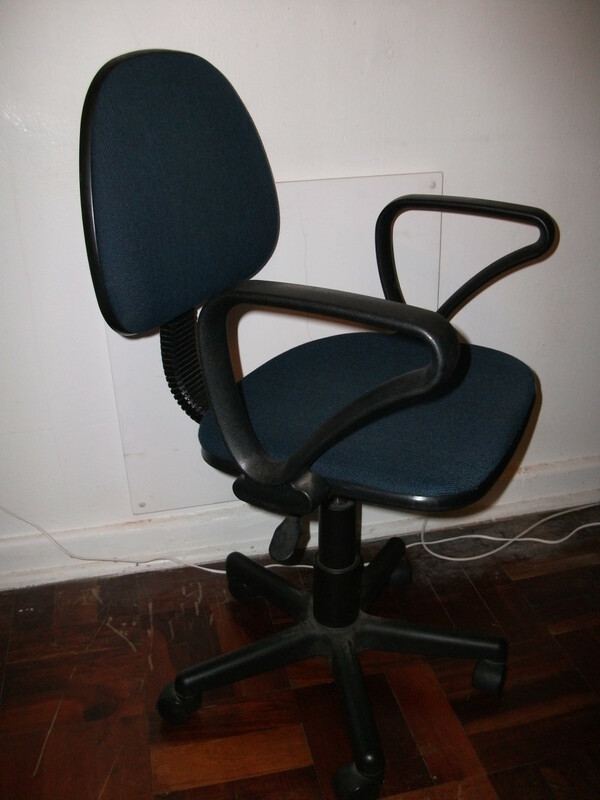 I am looking for a chair. I am over 6’2” and I need a taller chair so that my seating is like an”L”. Most chairs legs need to be 6” taller for comfort. Kaiser Permanente waiting room has good regular chairs. Waiting for more of your investigations. We have Tall People in our family 6'6" to 7'3". All blue collar works who can not spend $3K or more. The Beast by Best , it's an Indiana company , works over 6'4""
I bought a Stressless Magic recliner with adjustable headrest. Sadly, the adjustment is minimal and at full extent would seem to suit a person of 1.62m (5ft 4in). They make 3 widths, why not a tall version? And, yes I did try before I bought. I was fooled by the soft cushioning & nice leather. Didn't sit in it long enough to realise it wasn't supporting me as it should (no lumber support when I slid down the chair to fit my head on the headrest). Top tip - take a friend / relative who can observe how you look. Avoid the elephant on a bicycle/giraffe in a mini look - it's not good. Thought I would share a chair modification idea. I've been looking at recliners off and on for years. My grandmother had a solidly built, carpeted base made out of 2×4's or 2×6's, that was under her recliner when I was a kid. That base gave her chair height so that she could get out of her recliner with bad knees and arthritis. I mentioned to mom about building a base, like my Gram had, to make her chair easy for her to get in and out of. Then I realized that if I put mom's recliner on the same type of base, I would be able to raise her chair high enough to add an extension to the foot rest, a longer foot rest, so my feet don't hang over the end, and I'm 6'3" tall. What did you end up going with? My husband is 6'7'' as well and we have been chair shopping for a year now with no luck. My husband is 6'4" and he thought that on the Stressless chairs the arm rests were too low. Did you have any impressions on this? If some can find a custom recliner where the mechanical pieces are adjustable so the length can be extended, I'd love to talk with them. So far, I haven't found anyone. That is amazing that no one makes a custom recliner chair. With all of the tall people in this world I would think that some company would have done that by now. It would seem that the chairs with moveable ottomans will probably be your best bet if you can find one that supports your head. Good luck on finding a good fit. At 6'3", I'm on the short end of tall, but I certainly struggle with this sort of thing. Personally I've become really fond of satellite chairs lately. I've tried the oversized La-Z Boys, and enjoy those as well. I haven't had a chance to try any of the others on your list. I cast my vote for the American Leather Comfort Recliner. I like the style. Although I'm not tall (5 feet 2 inches) I wanted to take part in this hub. Recliners have come a long way since my day. I do hope you enjoy your chair Paul.